To investigate the potential health implications of perchlorate exposure in the general populations, CDC tested urine samples of 2,299 men and women from around the country for perchlorate and compared these findings with the levels of thyroid hormones found in the blood of these same people. The researchers were careful to adjust for factors such as age, race, pregnancy status, and medication use known to affect thyroid hormone levels. While analyzing the study data, the CDC's researchers discovered that there was a statistically significant relationship between urinary perchlorate and thyroid hormone levels in the 1,111 women tested. But the effects were particularly pronounced in women with lower iodine intake. †1 For women with higher iodine intake, perchlorate exposure was associated with increased TSH. For women with lower iodine intake, perchlorate exposure was associated with both increased TSH and decreased T4 levels. 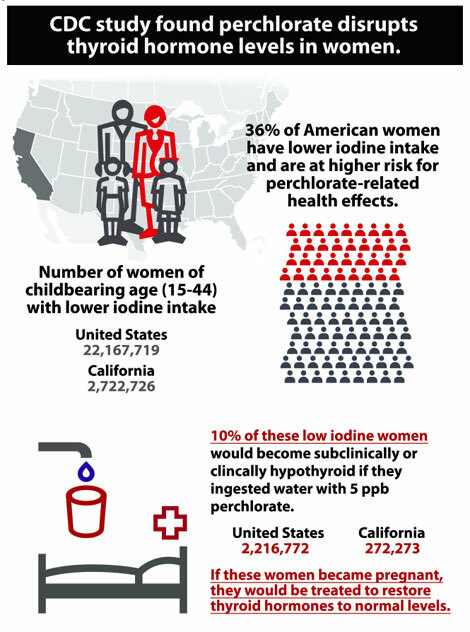 Since 36 percent of American women have iodine intake in the "lower" range as defined by the CDC, this means that more than one-third of all women are at heightened risk for perchlorate-related health effects. Even more important are the extremely low levels of perchlorate that were associated with thyroid hormone disruptions &em; and the magnitude of these disruptions. The CDC researchers found that if a low iodine woman started with perchlorate exposure corresponding to 0.19 ppb in urine (the minimum level found), and then ingested enough perchlorate through food and/or drinking water to raise her urinary perchlorate level to 2.9 ppb (the median level found), her T4 levels would drop by 13 percent.†2 Similarly, if her urinary perchlorate level increased to 5.2 ppb (the 75th percentile exposure), her T4 levels would drop by 16 percent. The maximum level of perchlorate exposure found was 100 ppb, which translated into a 29 percent decline in T4. It is reasonable to expect that if a person drank water with 6 ppb of perchlorate, the concentration of perchlorate in their urine would increase by roughly this amount. This is because perchlorate passes through the body unmetabolized in a relatively short time period, and because people pee out about as much water as they drink in a given day. 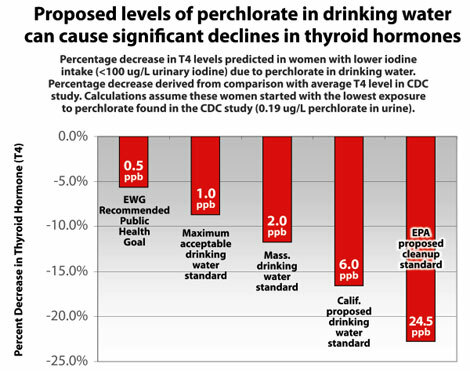 Extrapolating from the CDC's results, therefore, it is clear that all of the current proposed and adopted perchlorate standards will cause significant declines in T4 among women with lower iodine intake. When one also considers the CDC's results for perchlorate-related changes in TSH, the picture becomes even more troubling. As noted above, doctors rely on TSH levels to diagnose mild hypothyroidism. The CDC study found that 10 percent of low iodide women — those that started with TSH levels that were on the high-end of the normal range — were particularly sensitive to perchlorate. For these women, a given change in urinary perchlorate levels was associated with a much higher spike in TSH levels than women who had TSH levels closer to the median. And at a 5 ppb exposure level, these women's TSH values crossed the threshold into the range of subclinical hypothyroidism. Although it might seem that this sensitive group &em; women with low iodine intake with high-normal TSH levels &em; would be a tiny fraction of the population, it actually comprises about 3.6 percent of adult females. 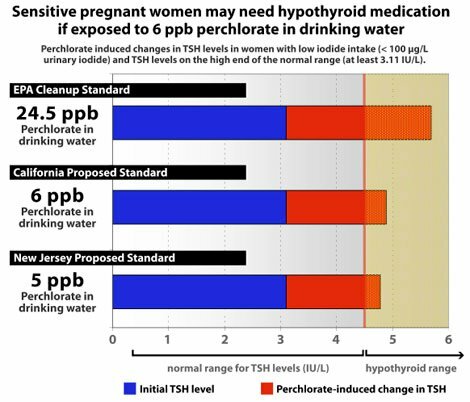 This translates into more than 2.2 million U.S. women of childbearing age who, if they drank water contaminated with 5 ppb perchlorate, would have to be medically treated to restore thyroid hormones to normal levels if they became pregnant. At the state level, this translates to more than 270,000 women in California and 65,000 women in New Jersey whose pregnancies would be at risk from perchlorate in drinking water at their state's proposed drinking water levels. Even Massachusetts's 2 ppb standard, adopted earlier this year, can't be considered safe since it would also push some borderline hypothyroid women into the range of mild hypothyroidism. †1 - Defined as <100 µg/L iodine in urine. †2 - The drop in T4 predicted to be 1.06 µg/dL. The percentage decrease calculated as compared to the average T4 level found in the CDC study (8.27 µg/dL).